We were skeptical, $799 per person for a week in Madeira plus 3-days in Sao Miguel, including airfare and 4-star accommodations? Was this deal too good to be true? And where is Madeira anyway? We quickly located Madeira in the Atlantic Ocean about 300-miles east of Morocco. Madeira is a Portuguese archipelago in the north Atlantic, southwest of Portugal. After scouring the Azores Getaways website, my husband and I decided that we would take a leap of faith and go for the trip. One of our best decisions ever! 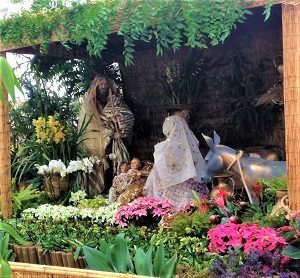 It was Christmas time and workers were very busy creating a life-sized manger scene, complete with camels, wise men, shepherds, angels, and the Holy family. Across the walkway, another crew was building an entire miniature village that wrapped around a mountain that had been carefully crafted to host the different scenes of village life. A little further and we looked up to see the reflection of the Atlantic Ocean off of a colorful cable car overhead. This was the cable car that rises 3700 meters (12,139 feet) to Monte where you can find small shops, places to eat, and an exquisite little chapel. The choice is yours whether to ride down on the cable car or toboggan in a wicker chair with two men shepherding you on the trip. It sounds crazy but isn’t as scary as it looks. As you walk along the streets of Funchal, hosts invite you to visit their restaurants, often holding a tray with a complimentary shot of Madeira wine to add to the enticement. Ah, that sweet, delightful, beverage that has made this island famous. A perfect prelude to any choice of cuisine for the evening. While Funchal is a great place to enjoy, Madeira has more surprises for those who venture out of the capital city. One is the Camacha Wicker Factory where skilled weavers create baskets, animals and even a full-sized replica of an old sailing ship. If you enjoy dramatic mountain views, don’t miss Pico Ruivo. There are several pathways for viewing and photography. If you’re into hiking, there is a network of hiking paths that will take you on a much more rigorous adventure. 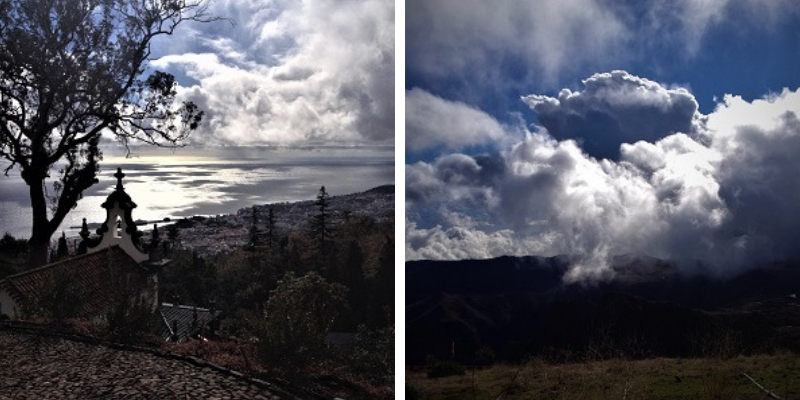 The locals will tell you that it is common to experience all four seasons on the same day in Madeira. This means that you have to watch the weather as you hike. For example, Pico Ruivo was windy but clear when we arrived, and within 30-minutes the storm clouds moved in, and we found ourselves in one of the daily weather changes that we were warned about! The Ribeiro Frio Trout Farm earns its reputation as a destination. The farm belongs to the parish of Sao Roque do Faial, the municipality of Santana, and is located about 15 km from Funchal. There is a restaurant that gets excellent reviews—especially for its trout—as well as gift shops, a little chapel and viewing or sitting areas set off by twisted natural wood railings. 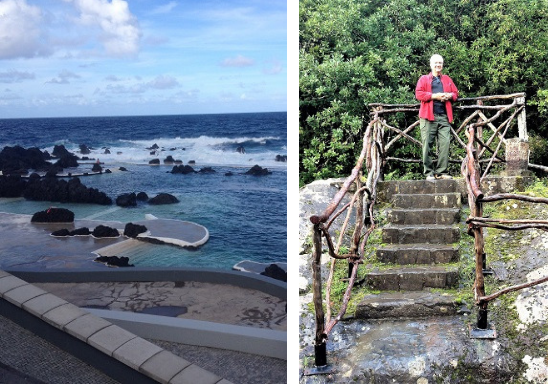 One of the best surprises is Madeira’s famous Porto Moniz natural swimming pools. In the winter, it is too cold to jump in the water, but walking around the pools or sitting down for a snack and appreciating the view is almost as enjoyable. Next visit will be in the summer! Beware of Madeira, it creeps into your memory and entices you to return. It definitely should make your list of places to visit and stay for a while.